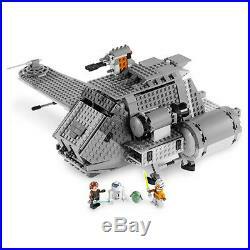 LEGO® STAR WARS 7680 The Twilight. Temperamental but tough, the Twilight is Anakin Skywalkers personal starship during the Clone Wars! Hes rebuilt and upgraded all of its systems from cockpit to cargo bay, including retractable landing gear and wings that rotate from landing to flight modes, a firing flick missile, movable laser cannon turrets, the side-mounted escape pod and a working tow-cable winch. Includes Anakin Skywalker, Ahsoka and R2-D2 minifigures, plus Rotta the Huttlet! The Twilight has moveable wings and retractable landing gear! Open the back to use the working tow-cable winch! Detach the side-mounted escape pod! Rotate the laser cannon turrets on top! Measures 12" (30cm) long and 18" (46cm) wide! Limited Edition - Hard To Find. Guarantee: SCARCE&CO is an authorised LEGO e-commerce retailer of LEGO products. 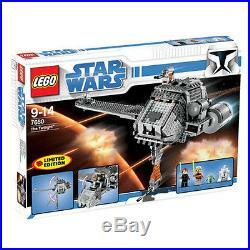 All of our LEGO products are brand new in original packaging and guaranteed to be authentic. LEGO and the LEGO logo are trademarks of the LEGO Group. 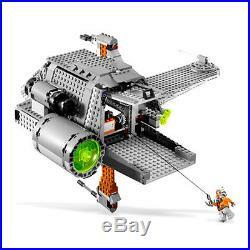 The item "LEGO STAR WARS 7680 The Twilight with 4 Minifigures Brand New Sealed" is in sale since Tuesday, March 30, 2010. 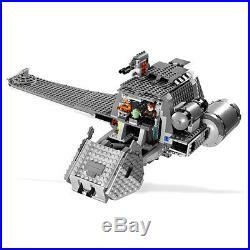 This item is in the category "Toys, Hobbies\Building Toys\LEGO Building Toys\LEGO Complete Sets & Packs".toys" and is located in AU. This item can be shipped worldwide.